Nothing we consume lacks an underbelly. In his June 26 NY Times column, Nicholas Kristoff tears open the underbelly of electronic gadgets built using minerals such as gold, tantalum, tungsten, and tin. In the Congo, site of one of the most horrific wars in history, warlords control the extraction and sale of these minerals to finance their butchery. 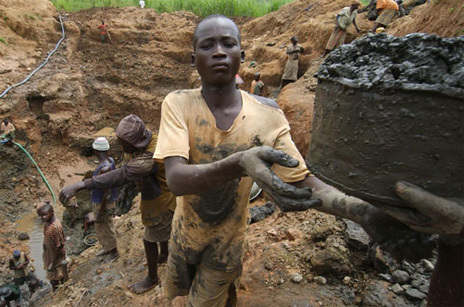 Kristoff writes about the movement to make consumer electronics companies more accountable for the sourcing of the minerals they use to manufacture their products. In conference, the Dodd-Frank Wall Street Reform and Consumer Protection Act beefed up considerably provisions in the bill for requiring corporate disclosure in SEC filings of sourcing of minerals from the Congo. See Section 1502, which goes on for 14 pages. subparagraph that is included in such report. source and chain of custody of such minerals. 12 factured by such person. 22 emption, on which such exemption shall expire. 13 Reform and Consumer Protection Act.”. in labor or human rights violations. conflict minerals under section 1502, as appropriate. 14 of the Congo and adjoining countries. 25 of the Congo and adjoining countries. 12 the Congo or an adjoining country. 23 uct manufactured by such person. 8 13(p) of the Securities Exchange Act of 1934. 23 cratic Republic of the Congo. 4 Congo or an adjoining country. 21 Congo or an adjoining country.